Now that Food52's Managing Editor Brette Warshaw has stocked her First Kitchen, she's ready to throw parties in it: no-stress weeknight parties for anyone, anytime, and (almost) every kitchen. You're invited. Today: Tomatoes for dinner, because that's what you really want right now. All I want to do right now is eat tomatoes. 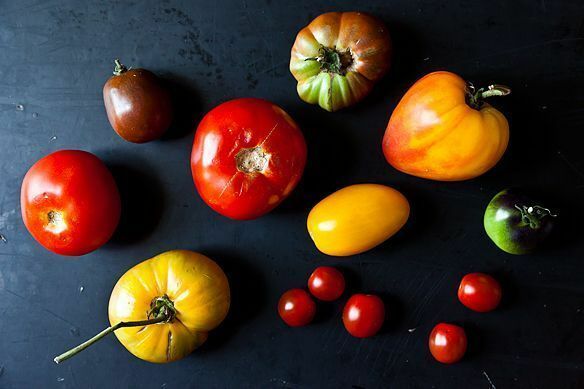 I want to eat tomatoes with big, fancy salt, and I want to drizzle them with olive oil. I want to slather toast in mayo and put tomatoes on top. I want to bite into tomatoes like apples and not care about the sticky juice that stains my cheeks, my wrists, my dress. I don't want other good things like bacon or cookies or chocolate cake; I just want to eat tomatoes. So rather than slave over a piece of meat for a dinner party -- and then need to eat it for dinner -- I decided I'd slice tomatoes for dinner. I'd take the money I'd spend on a normal main course, and I'd spend it on the prettiest tomatoes I could possibly find. And then I'd serve them on a platter with toast and homemade aioli and avocados, and my guests could sandwich them together and thank me earnestly, profusely, because eating tomatoes is all they want to do right now, too. This meal isn't all no-cook, mind you. But the cooking is all done the night before, when you can sweat and curse in private and look completely clean and put-together and perfectly host-y by the time your guests arrive. With just some stirring, folding, and slicing, a dinner party is done, and you're eating cherry-almond-striped fools for dinner and for the first time in a long time feeling happy, satisfied, and civilized. Two nights before your party: Soak your beans for your salad. 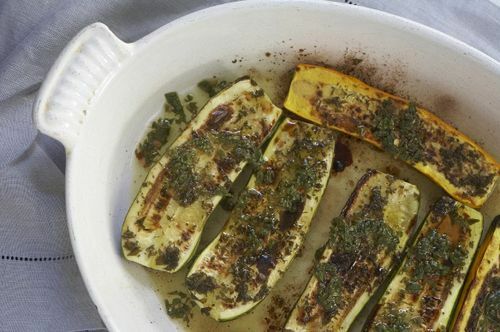 The night before: Roast your zucchini, saving some of the vinaigrette to throw on right before serving. Simmer your beans while you're at it. Make your aiolis; I made a classic one and an anchovy one, but feel free to flavor them however you'd like. Cook up your cherry mixture for the fool, and bake your honey almonds. You're almost there! When you get home from work: Time to prep! Slice your cucumbers; get them draining over the sink. Whip your cream. Cut up your radishes and red onions. Make your salad dressings. Take out the zucchini from the fridge; let it come to room temperature. 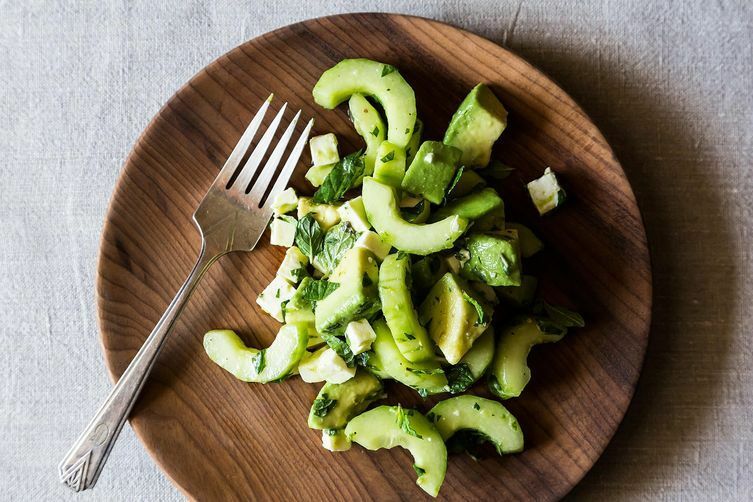 A half hour before your guests arrive: Finish up your cucumber-avocado salad, and stick it in the fridge to meld. Slice your bread. 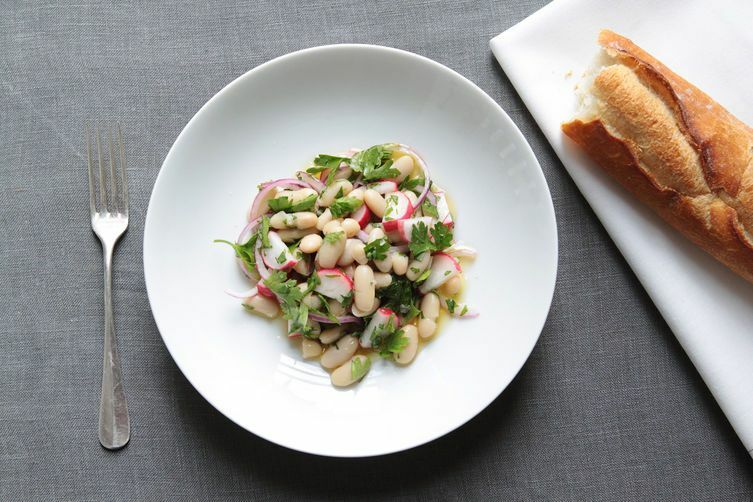 Toss together your white bean salad, and let that meld in the fridge, too. Party time! When your guests are finishing up their cucumber salads, stick a tray of bread under the broiler to toast. Slice your tomatoes, and arrange the on a pretty platter. Serve the bread, tomatoes, aiolis, and sliced avocado separately, so that your guests can construct their own sandwiches. Bring out the zucchini and the white bean salad to go with. When all the tomatoes are gone: Fold together your fools, garnish with honey almonds, and be happy, so happy, that it's summer. Great menu -- I'd love to have every single thing on it. And I completely agree with you and amysarah about BLTs. Just recently I ran across a mention of brown butter mayonnaise; I can't wait to try a batch thinking that it could take the BLT to new heights. There's nothing better than a tomato sandwich in the summer, when tomatoes are at their peak. No exaggeration. Actually, it's a tie between that and a BLT (which is really just a variation.) Salivating just looking at the photo. I'm so with you. There are few things better than a perfect BLT. BLT's and tomato sandwiches = unreal. a version of BLT w/ arugula mayo and avocados is pretty awesome too!